This trip to Newcastle was quite unexpected and pulled together in just a few days. I’d been wanting to visit Auntie P for some time now, ever since I learned she’d got married for the first time late in life and was now caring for her frail husband. But I couldn’t quite figure out how to get myself to Northern Ireland because other travel plans always seemed to take priority. Then, about 3 weeks ago, when I learned my cousin G was planning a celebration for his 50th wedding anniversary (! ), and the event was to be in Newcastle – even though he and his wife live in Rathfriland some miles away – I realized I could see Auntie P and celebrate with G. And this being the year I’ll turn 50, it seemed a fitting way to be a bit extravagant, by connecting with old friends and family. As if it was meant to be, I was able to find a direct flight from Newark to Belfast, especially since I didn’t want to risk getting stuck in an airport somewhere, given the unusually cold and snowy winter we’ve been having. 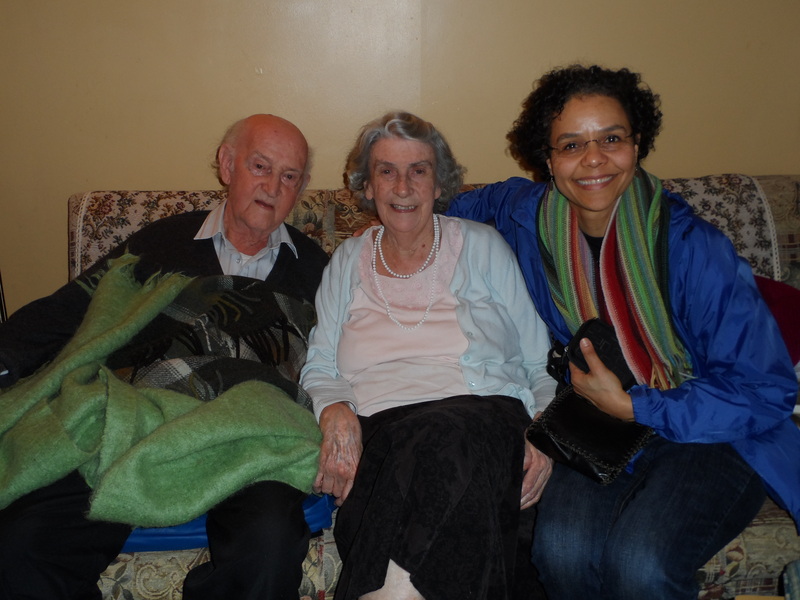 In the few days I spent in Newcastle, I was able to share 3 meals and another evening having tea with Auntie P and her husband of 10 years, Dr. G. They both worked for the same mission agency and knew of each other in their university days at Queen’s in Belfast, but G was a little older. He spent most of his years in Nigeria at a 32 bed hospital in Unguru, in the northeast, 5 miles south of the border with Niger. He married a British nurse some years older than him, had 3 children, and returned to Northern Ireland in the early seventies. After many years at home in general practice and only after his first wife died, did he and Auntie P connect in a romantic way. I didn’t manage to nail down the specifics re: their courtship but Auntie P was engaged at 76 and married at 77! Dr. G is delightful. Though with limited eye sight now – he has macular degeneration – and is hard of hearing – he’s managing without hearing aids until an appointment in early March, he regaled me with stories of his days in Nigeria, including a time when he removed a 44 pound tumor from a woman’s abdomen! She left the hospital 10 days later, dancing, and looking 20 years younger. What an incredibly special treat it was to spend time with them, meet their care givers – Auntie P has several delightful women who rotate in through the day to help her with her husband – and hear about the rich, full lives they’ve lived. That alone was well worth the trip across the Atlantic, even if I hadn’t also had the great fun of being @ G’s Golden Wedding Anniversary dinner. What a beautiful and encouraging story!